Universal Orlando Resort will be opening up their latest attraction Race Through New York Starring Jimmy Fallon next Spring and today they’ve pulled back the curtain to reveal new details of the ride along with concept art of the outside area that has replaced Twister. Among all the new tidbits about this curious new attraction over at Universal Orlando’s official blog, we now know that guests in the queue area will be “hanging out” at Studio 6B Club where they’ll enjoy a performance from the Ragtime Gals barbershop quartet, meeting “Tonight Show” mascot Hashtag the Panda, and enjoy classic moments and hilarious bits from the legendary show. You’ll even be able to sit behind an “Interactive Desk” and be the host as you send out personalized “Tonight Show” Thank You Notes to your friends and family as well as warm up your driving skills with a ‘Jimmy Drive’ retro-style video game. 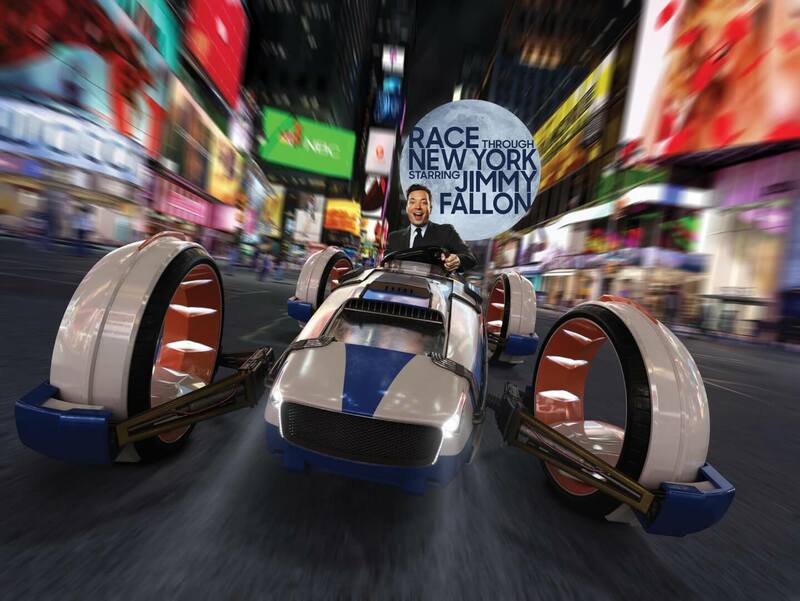 Guests will be treated at the NBC Studios to the history of the classic show throughout its 62-year run and they’ll be able to view real set pieces and memorabilia from the “Tonight Show,” including a display honoring Fallon himself. If that’s not all they’ve also released a behind-the-scenes video of the making of the new Universal Studios Florida attraction. Universal Orlando Resort guests will soon be able to experience the ride for themselves when Race Through New York Starring Jimmy Fallon officially opens next Spring. Actress and conservationist Bindi Irwin visits Disney’s Animal Kingdom! End of April, hopefully? We’ll be in town for the Star Wars Dark Side Half Marathon, and plan to take a day to go up to Universal (to get our Harry Potter fix). Would be awesome to check out a new attraction while we’re there! I have a feeling this ride will toss you around hard and give you severe motion sickness. I hope it won’t be worse than the Simpson’s ride and Transformers. The flying part, not shown, will likely not be the calm Disney Soarin’ type ride. Seeing Fallon spinning around like that already gives me indigestion. I’m glad to hear you’re not fat. As for p*ssy willow, motion sickness can’t be helped. Newer Newer post: VIDEO: New ‘Suicide Squad’ Extended Cut trailer delivers more Joker and Harley Quinn!